Today’s been rough, Squiders, so for the sake of my poor brain, I’m going to keep this simple and go through some of the speculative fiction stuff I’ve been consuming lately. Forever is a crime procedural/supernatural show on ABC. I started watching it because a friend is obsessed, and I’m glad I did. I did binge the whole season (the finale is on next Tuesday) in about a week in a half, but I really like it. I like all the characters, I like the way they’ve twisted the crime procedural and supernatural plots together (especially since so many shows keep them separate, for some reason. Why mix genres if you’re not actually going to mix genres? ), I like the writing. It’s one of the best scripted shows I’ve seen recently, and the cast is brilliant and I love them all. Unfortunately, the show is in a dead time slot and ABC has done a crap job advertising it, so it seems like a lot of people have missed it. But I highly recommend it, and I also recommend starting from the beginning so you can watch the story unfold. The Queen of the Tearling is a fantasy (???) novel that came out last year by Erika Johansen. My BIL recommended it to me at Christmas, and I finally got around to reading it (well, my library got a physical copy for me to check out). I enjoyed it quite a bit. It’s very much a set-up novel, but there’s enough hints of stuff happening in the background to keep you interested and reading. I’m very much intrigued about the world-building. The setting and the plot are very much fantasy, but there are hints that it might be science fiction, or possibly alternative history. And I admit that it annoys me that I can’t tell, but I did enjoy the book enough that I will pick up the next one when it comes out. I was all caught up on Night Vale as of last October or so, and then I stopped listening. Not sure why–easily distracted, partially, and I think it may have been because they had a really interesting story arc going for several episodes, leading up to the 50th episode, and then, afterwards, they went back to their normal format, and I found it kind of a letdown. But I’ve started listening again (picking up where I left off), and either because there’s some distance between me and that story arc, or because they’re dangling the occasional tie to past events, I’m enjoying it again. Give me a week or two and I should be caught up to present day. How about you, Squiders? Anything interesting you’ve read/seen/listened to lately? Any comments of anything I’ve read/seen/listened to? Good morning, Squiders! 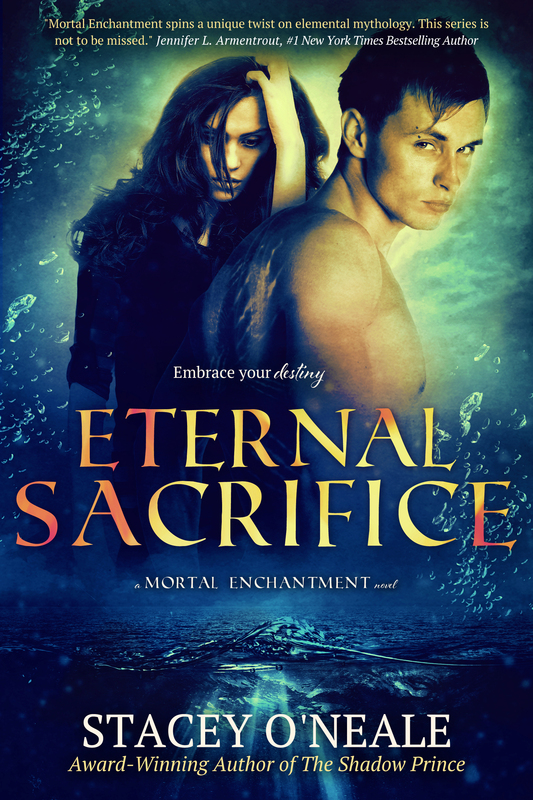 Today it is my pleasure to share the cover for the latest and final book in Stacey O’Neale’s Mortal Enchantment series, Eternal Sacrifice. To celebrate, the first two books of the series, The Shadow Prince and Mortal Enchantment, are free on Amazon from today (April 24) through April 28. You can find them here. Stacey is also doing a Rafflecopter giveaway for a $100 giftcard. Please click here to enter! I meant to tell you guys that if getting to a writers conference isn’t doable, either from a money standpoint or because of a scheduling issue, or if you’d like to get an idea of what a writing panel might be like to see if they’re useful or not, you should check out your local nerd convention. Scifi/fantasy and comic conventions often have some writing panels, since several have authors as guests. The guests tend to skew toward science fiction, fantasy, and horror authors, but it depends on the convention and the year. These can be very hit or miss. I have gone to some truly terrible and useless panels on things that sounded interesting, like publishing or networking. I have been to some that gave me a lot of good information. Some of these panels are aimed at local resources, which can be good for helping you find writing groups and other help in your general area. Others are more industry-based or genre-based than craft-based, which can be good for beginning writers or people interested in seeing where the market seems to be going. Author and writing panels at comic/scifi cons are generally culled from the authors and publishers attending the conference, so bigger conventions are probably going to have bigger/more experienced people than smaller ones. It does depend, though. Kevin J. Anderson is a local author, and he tends to hit all our cons, even though I would consider him a “bigger” speculative fiction author. You may have big name authors near you that like to do the same. You can check your con’s website and schedule to see who’s coming. Look at both the guest list and the vendors. Some places specifically have scifi/fantasy literary conventions. These are, of course, a little more specialized, so in theory the panels might be more relevant. But it still depends on who’s going to be there. And that’s not to say that a smaller name author can’t have a ton of useful information to share, or that a big name author won’t be completely useless. As you become aware of your local author community, you’ll learn who’s a good bet. It also somewhat depends on how the convention is run. In some cases, panelists submit their own panels to con staff. The panelists typically prepare for these, so you get more coherent information. At other cons, guests or vendors may show up to discover they have been assigned to panels they were previously unaware of. At least one con I know of, you just tell the panel person you’re interested in doing panels, but you don’t know which ones (or when) until you arrive. So if writers conferences aren’t going to work for you for whatever reason, give your local cons a look too. They’re cheaper, you might learn something, and, if nothing else, you can network with local authors. For a general answer, I would say yes. There’s a lot of useful things that can be gotten out of a writers conference: networking with other authors, the opportunity to see where your genre/the industry seems to be heading, and the ability to get feedback from other authors and agents. Plus there’s normally a wide variety of panels available, often ones that are genre-specific, or can be useful for publishing or marketing. For a long answer? Maybe. The main problem with writers conferences is that they’re ungodly expensive. The big one near me (this weekend, in fact! ), Pikes Peak Writers Conference, is almost $400, without hotel costs and the like. I’ve seen some that are closer to $600. Our smaller conference, Colorado Gold, is close to $400 as well. That amount of money can be hard to justify, especially year after year. And it’s up to the individual author as to whether this is money well spent or not. I would argue that the people who get the most out of writers conference are either beginning writers, or people who are actively submitting/publishing. While there are a wide variety of panels, some get repetitive, or cover information that experienced authors already know. It’s good to network at any stage, but it can be hard to keep in touch with some people if you’re at very different stages or if you’re not actively producing. Getting feedback from authors, agents, and editors can be invaluable, but if it’s the only thing you hope to get out of a conference, there may be cheaper ways to do so. Remember that there are other avenues outside of conferences. Local writing groups often host exercises, panels, and critiques, or there may be authors in your area that teach classes. Some writing groups also host speakers such as authors and agents. So it’s up to you whether the money is worth it. I’ve done Pikes Peak twice and had a good time both times, but I was also actively looking for agents at the time. I haven’t been able to justify the money since then, not with where I am and what I’m doing at the moment, though I may look at doing a conference in the fall or, more likely, next year. I’ve also made some good connections through my involvement. If you are looking at attending a writers conference, take a look to see what people who have attended before have said about it, and if it seems like a good fit for you from an experience and genre standpoint. I recommend taking a friend. That way you can divide and conquer if two interesting panels or events fall at the same time. (Preferably a friend with similar writing interests as yourself.) And if you do go, don’t hang back from trying something because it sounds scary. Get your money’s worth. Remember that everyone feels self-conscious about their writing sometimes, and they’re unlikely to laugh at you. Have you been to a writers conference, Squiders? Yay or nay? Best one you’ve attended? Planning on going to any soon? Websites are still down. Sigh. So, I mentioned earlier that I’ve taken over the storycraft meetings of my local speculative fiction writing group. I really enjoy these meetings, but I sometimes find it hard to pick appropriate topics to discuss. 1) I don’t necessarily always know the level of the writers who are attending the meetings. Some members have just started writing; others are pro-writers, members of SFWA, traditionally published, the whole shebang. Some people are working on their first first drafts; others are trying to figure out how to submit to markets for the first time. I like to pick topics that will be beneficial for everyone. 2) Sometimes it feels like we’ve already talked about a lot of things–I’ve been in the group for two years, others have been around longer. How many times can we talk about plot or characters or coming up with titles? 3) I don’t know how interested people are in non-writing aspects of being a writer. Do people follow trends in our genre(s)? Do they care about discussing news about awards or controversies? Do they want to look at published books and dissect them? How open are they to doing a non-traditional meeting, where instead of discussing a writing topic, we do an exercise or read something else? Not straight writing exercises, though. I hate those. So, Squiders, what can be considered storycraft for meeting purposes? Do I need to stick with straight writing topics–editing, worldbuilding, aspects like pacing and conflict–mixed in with genre topics–tropes and other defining aspects? Or can I mix in other things like current events, marketing, looks at favorite books and why? Anyone have any advice for making sure a topic is useful for everyone, regardless of skill level? Before I get started, Squiders, let me note that both KitCampbellBooks.com and KitTheEditor.com are currently down. Apparently some sort of malicious source code snuck in through one of my WordPress plugins and tried to send people to other websites, so my host is currently going through all the code for both sites to find the culprit. Unfortunately, this will be a lengthy process, and the sites will then need to be rebuilt from back-ups. So I apologize if you went to either site while they were infected (though my host assures me they caught it quickly) or if you need/want information that is normally hosted there. You can find both my personal and editorial email addresses above (under “contact me” and “hire me!” respectively), and please feel free to send me an email if you need anything. I’ve recently taken over the Storycraft meetings of my local speculative fiction writing group (and hooray for having a genre-specific writing group), which means I’m in charge of coming up with discussion topics. But I find that group discussion is excellent, because not only does it allow you to hear other people’s processes, but it forces you to look at your own in more detail. Last time we talked about characters. And going into the meeting, I would have told you that my characters come to me fully formed, with names and characteristics attached, and that they were one of the easiest parts of my story creation. But there are nuances. Yes, I can’t write a story before I have a character, but while some characters show up fully formed at the beginning, others just appear as needed. In some cases, the characters spring directly from the world, or from the plot, and without having those aspects first, I can’t have characters. In other cases, characters show up with nothing attached to them, leaving me to scramble to try and find someplace for them to fit. And, for me, names are essential. Sometimes, when I’m still in the character forming stage, I’ll troll about name websites, looking at meaning, waiting to have that flash on insight, to have the character show up. Sometimes I have to make a list and the character meanders in a little later. But it does make it really hard to change names. It always changes personality for me. What is your character creation process? Does it change based on the circumstances or the type of story? Good morning, Squiders, I hope you’re all doing well. I haven’t been sleeping so well lately, so I’m a bit sleepy. I’ve come across a couple of websites lately that I feel could be of interest to other writers and authors, so I thought I’d share them with you all in case you’re unaware of them. The first is The Grinder, which I found randomly yesterday while I was submitting some short stories to various markets and looking at different anthology calls. Everyone remembers Duotrope, right? Duotrope was (is) a site that kept track of short story markets and allowed you to track your submissions. It had (has) stats for each market based on user input, including likelihood of being accepted. But a while ago it went paid, $50 a year or something. Well, the Grinder aims to do what Duotrope used to do–allow writers to track short story submissions and provide user-based input on markets. It’s still in beta, but if you miss Duotrope, definitely give it a look. The second is WriterPitch.com, which looks like an interesting concept, but I do not claim any first hand knowledge as I have not personally participated. WriterPitch allows both writers and agents to make accounts, and the idea is that writers can post pitches for their books, and then agents can go through and see if anything interests them. Alternately, agents can post wishlists, and writers can query if they have a story that’s a good match. I have no idea what the writer to agent ratio is (it looks about 10:1 based on number of profiles), whether any agents are seriously looking at the website, and whether anyone has found any sort of success. But if you’re actively looking for an agent, you might give it a look and see if you think it will meet your needs. Have you noted any interesting websites lately, Squiders? I got an interesting survey from Goodreads some months back, asking about new author features, but to my knowledge, none of those have gone into effect yet.